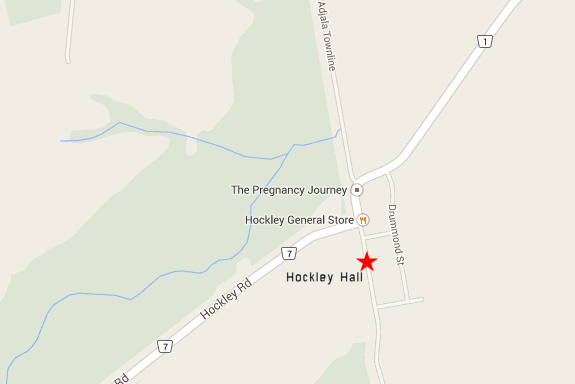 The Hockley Historic Community Hall & Church (HHCHC) was incorporated as a not-for-profit organization through affiliation with the Ontario Historical Society on April 5, 2018. Both the community hall and the church were conveyed to the Hockley and surrounding community by the Hockley & District Senior Citizens Club and the United Church of Canada respectively on May 18, 2018. Both buildings have a long rich history in the Hockley and surrounding area. After almost 125 years of these two buildings residing side by side, they are now joined as one parcel to be used and enjoyed by the public. This not-for-profit organization is operated by a dedicated volunteer Board of Directors. Their mandate is to preserve the historic essence of these buildings as vibrant gathering places. This extends to the present day spirit of community through get-togethers such as our annual Strawberry Pancake Breakfast & Silent Auction in June, Community Carol Service in December, dinners, concerts, exercise classes etc. Any rental and fundraising income is put towards expenses such as heat, hydro, insurance, administration, maintenance and restoration. Rentals of both buildings are most welcome for events such as weddings, baptisms, memorials, meetings, workshops, family dinners etc. Please visit the Facilities & Rates section of our website for more information. Volunteers are very welcome. Please contact us for more information.